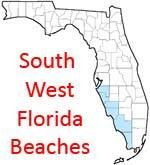 You can expect to find many beautiful state parks and public beaches on the South West Coast of Florida. White sand, crystal clear blue water and beaming sunshine. The Gulf of Mexico is not as volatile as the Atlantic Ocean so waves are not a problem. The Historic Village of Boca Grande, on the island of Gasparilla, is located at the southern tip of the Cape Haze Peninsula on Florida’s Southwest Coast midway between Sarasota and Ft. Myers. Nature has blessed this lush barrier island with seven miles of powdery white beaches stretching the entire Gulf side and surrounded it with cerulean waters—the kind one usually finds only in the Caribbean. The adjacent estuaries fed by the Myakka and Peace Rivers converge to form one of the most pristine and productive coastal ecosystems in the world. Ideally located north of Marco Island and just between Naples and Fort Myers, the community of Bonita Springs offers the unique and inviting Old Florida lifestyle of a charming small beach town. Beautiful beaches along with the sparkling Gulf of Mexico and the natural beauty of Estero Bay offer sun-lovers and anglers the ultimate paradise. Bradenton Beach is a charming and vibrant community of 1,500 located at the southern end of Anna Maria Island. The Island is located at the southern entrance to Tampa Bay on the Gulf of Mexico. We share the island with our sister cities of Holmes Beach and Anna Maria City. Sun splashed days and balmy nights mean funtastic playtime fantasies come true in Cape Coral. Sandcastles, beaches, boats and bait fill leisure time in this coastal community that boasts more than 400 miles of canals, plus lakes and a mega-river. The city has a water-filled treat of its own design. Sun Splash Family Waterpark offers more than two dozen wet and dry attractions on 15 tropical acres. Loll in a tube while gentle currents take you on a sightseeing voyage around the park. Or grip the sides and grit your teeth while you pitch and plummet in Cape Fear's 225-foot black tunnel. Captiva Island, sister to larger Sanibel Island, is just over a small bridge which crosses at Turner Beach. Turner Beach is a great place for catching that prize fish and also for finding the colorful shells that these islands are famous for. The beach stretches 5 miles to the northern tip of Captiva Island at Redfish Pass. From the bridge at Turner beach, Captiva Drive is a scenic drive past giant cactus, colorful bougainvilleas and other tropical flora along a stretch of sea and sand ending at "downtown" Captiva, which is more of a village than a town. The narrow, 8-mile long island of Casey Key is one of Sarasota's hidden gems, an isolated and exclusive enclave just off the sleepy mainland town of Nokomis. There are only around 400 residents, no massive hotels and little else besides a single road and two public beaches. Casey Key might not have as much going on as some of Sarasota's more lively islands, but for many people that's part of its charm. Whether you come here for a week or join us for a lifetime, you will soon find why our favorite expression is "Just another day in paradise." Our wonderful climate, tropical beaches and beautiful bay are only some of the reasons Englewood has become known as the "Gem of the Suncoast." Fort Myers Beach has a lot to keep the entire family entertained, and we have provided a list of some of the activities that will interest you. Beach bunnies hop to Fort Myers Beach, the sugar-sand island tagged the world's safest beach, with gentle slopes and sand bars. Located in Manatee County, Holmes Beach is the largest of three island communities on Anna Maria Island, which is found on the Gulf of Mexico just south of the mouth of Tampa Bay. Bordered on the north by Anna Maria and on the south by Bradenton Beach, Holmes Beach boasts three miles of gorgeous white, sandy beaches. The city also offers easy access to the Intracoastal Waterway which traverses Anna Maria Sound. Whether you like to spend your time shelling, biking, shopping, fishing, golfing, or dining, opportunities for these activities are boundless on Longboat Key, Lido Key, and St. Armands Key. Well known as private islandparadises, there are accommodations here to suit everyone, from deluxe suites in plush resorts and condominiums to beachfront cottages and modest hotel rooms. The area is appreciated by wildlife as well, so these waters are home to manatee, dolphins, and fish, while pelicans, osprey, and a variety of shorebirds find sanctuary here. Tennis and golf enthusiasts will find first-class facilities here,and there are several parks on the Keys to visit for a relaxing afternoon. Marco Island is the largest of Florida's Ten Thousand Islands, located on the Gulf of Mexico in Southwest Florida. It has been described as Magical, Mystical and Alluring. The attraction is tropical sun-washed white beaches and a casual easy paced life style. Sunshine, frolicking dolphins, and all of the water and sun sports that go with the beaches are available for your pleasure. Naples is the crown jewel of Southwest Florida -- nestled on the sun drenched beaches of the Gulf of Mexico. Naples is known for world class shopping, dining and abundant, challenging golf courses. It is also, only steps away from island seclusion or the untamed tropical wilderness of The Everglades. Boasting one of the nation's best sandboxes and calmest seas, Naples makes a splash with water lovers and recreationists. Friendly parks beckon sports enthusiasts and picnickers with lovely green spaces and recreational facilities. Naples is located on the Gulf of Mexico in Southwest Florida. Have you ever dreamed of being on a tropical island, your toes in the soft white sand, an expansive beach, swaying coconut palms, lush tropical foliage and beautiful crystal blue water. Imagine watching the pelicans and herons fish for their dinner, collecting "treasures from the sea," pastel colored seashells, while the sandpipers scurry along the surfs edge. In the Sarasota area, you can enjoy the breathtaking sunsets, educational museums, operas, ballets, plays, golf tournaments, and boat races. You can join in tennis, lawn bowling, water skiing, shell collecting, bird watching, growing exotic tropical plants, university classes, golf, or boating. You will find it alive with tropical atmosphere, blessed with the "world's finest, whitest beaches," filled with charming hideaways, and always offering plenty to do - but it is also a place to relax, and let the warm breezes, cool water and soft sand transport you to your personal paradise! South Venice is a community in Venice Florida just south of Sarasota on the west coast of Florida. The community's most unique asset is a deeded 1,300 foot beachfront property on the Gulf of Mexico, plus a ferry and boat launch for the benefit of the Greater South Venice Community; not to mention an "Old Florida" feeling among the streets and parks. Known as the "Shark's Tooth Capital of the World" because fossilized shark's teeth wash up on the beach from a large fossil deposit offshore. It attracts divers to its coral reef about one quarter mile offshore.